Madari Basti in Sanganer, Jaipur, has become synonymous with street magic. It is the bread and butter for most people residing there. Almost every household has one street magician to its credit. Some of them are veterans who can make a rubber snake come to life and dead pigeons fly, while others are amateurs who are learning the tricks of trade. For these budding street magicians, the first task is to learn the trick of making coins vanish in thin air and reappear in someone’s pockets or behind someone’s ears. One such upcoming entertainer is 12-year-old Sohil Khan. Sohil, a Std IV student in the Government Upper Primary School in Pratapnagar, Jaipur, is among the many children for whom school is a silver lining. Street magic has long been a form of art which has been passed on from one generation to the next. Of late, however, it has lost its sheen. Even the veterans of the trade want their children to get a proper job instead of walking the path of struggle that they have endured all this while. After Sohil’s mother passed away, his father, Umad Khan, married Jafran. He has three sons with his first wife: Sohil, Ronit, and Taufiq, and three with his second wife, Mohit, Tauheed, and Shoaib. Sohil and his younger brothers, Ronit and Taufiq live with their grandmother, a few blocks away. Both of them are in Std III in the same school as Sohil. His stepbrothers, in contrast, are too young to attend school. 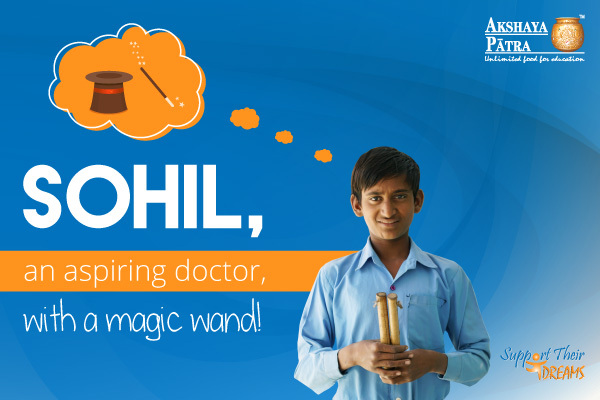 Young Sohil aspires to become a doctor and is willing to work hard to realise his dream. He likes studying, but Mathematics and English are his favourite subjects. His intention is to earn good money and get his grandmother and his entire family, including his stepmother and step brothers out of the throes of poverty. “We have a small house, which is not in good shape. I want to renovate it and maybe add another floor, so that all of us can live together,” he says. Sohil goes out on Sundays or other holidays to perform street magic in different parts of Jaipur and during vacations, he even goes to other locations with the elder boys in the neighbourhood and works as a jamura (assistant). Like other children, even Sohil likes to play with his friends. After returning from the school, he completes his homework and then steps out to play hide-and-seek or catching-the-ball. The idea of banter with friends brings about a smile on his face. Then there are days when, instead of stepping out to play, he has to step out to support the family. On a good day, he earns Rs 50-100, but on most days, it’s around Rs 10-20. Sohil has fond memories of the time he spent with his father. He remembers his father telling him to concentrate on school because he believed that it will help him in the future. As with other people in Madari Basti, even Umad Khan perhaps felt that his sons should take up a good job so that they don’t have to worry about their future — a sentiment that is shared by Sohil’s daadi (grandmother) as well. Sohil’s grandmother was glad that they had learned to perform magic but she didn’t want them to pursue it as a career. “We just taught them these tricks so that they can earn for themselves if need be, but I would prefer if they work hard and get a proper job instead of depending on Rs 40-50 that they earn from performing on the streets,” she says. According to her, street magic had no future. “You ask for Kathputli Basti in Jaipur and everyone knows about it. Making Katputlis is considered an art form, so Kathputli Basti has become famous. Ask for Madari Basti and no one knows about it. The deplorable condition we live in is only because street magic is not considered an art anymore,” she implores. Sohil’s family lives in such difficult conditions, so it isn’t surprising that he likes the variety of food that is served at school. “My favourite is Dal Chawal, but we also get Roti, Halwa, Kheer, Rabdi and even biscuits and bananas at times.” Even his grandmother is thankful that the three of them get one good meal in school. When Sohil starts performing, he makes sure that he gives his 100%. The enthusiasm on his face is difficult to miss. As with born performers, even he can magically connect with his audience by merely interacting with them. It’s too early to say whether he is destined to make it big in the world of magic, or whether magic will just be a hobby for him in the future.